According Penn State Small Business Development Center director Heather Fennessey McWhorter, the success rate of start-up businesses locally has increased from 20 percent to 80 percent. The SBDC is an institution that provides education and information specifically to young entrepreneurs. Under the SBDC leadership, Penn State has grown to be a proud partner and organizer of the annual Global Entrepreneurship Week (GEW). Held this year from November 13 to 17, GEW celebrates entrepreneurial innovation and creativity. All the events during the week are planned and sponsored by Chamber of Business and Industry of Centre County (CBICC). The week is designed to answer questions about entrepreneurship, from general to specific. Its process is created to gradually lead students and community members from inspirations to real hands-on experience in a safe environment. McWhorter took time to talk about entrepreneurism and GEW. T&G: Some people have this concern that entrepreneurship is way too difficult and risky. What’s your opinion on this concern? McWhorter: Although the whole week is about celebrating innovation and creativity, we have to understand that entrepreneurship is not for everyone. It is for people who are self-motivated and independent. The decision of pursuing entrepreneurship largely depends on that person’s risk tolerance. To people who want to stay safe, this will not be a good idea. There will be workshops toward the end of the week that center around self-analysis. People will have to answer questions like, “Who are you as a person?” “Is it something you really want to do?”— to make sure it’s the right decision for them. To people that are already certain about their business ideas and ready for the next step, there will be workshops targeting market research, patent, intellectual property, risk analysis, etc. T&G: What are some of the special workshops? McWhorter: There will be various different workshops and speeches scheduled throughout the week. For example, one of the most notable workshop sessions is “I wish I would have known.” It will have Penn State alumni and local business owners come and touch on some of the wrong steps they took when they first started their career. Sometimes, students hold back from pursuing entrepreneurship because they fear the unknown consequences of failing. … There are way too many motivational speeches out there painting the wonderful lifestyle of being an entrepreneur, but very few of them address their failures and mistakes along the way. This kind of workshops can give students an insight on what to avoid when they get to that stage. T&G: Is entrepreneurship strictly about marketing business? McWhorter: It’s hard for some college students to see the correlation between entrepreneurial field and their current academic focus. When they think about entrepreneurship, they automatically think of business schools, major American corporations, etc. But everyone can be an entrepreneur regardless of what they learn in school. There is a variety of entrepreneurs, such as freelancer, app designer, consultant, private educator — they all belong to this category. … Everyone needs some sort of entrepreneurial skills in today’s market place, such as networking, selling business ideas, creating ideas, etc. Having those skills under your belt will definitely benefit you in your career. T&G: Do networking events and workshops create competition among young entrepreneurs? McWhorter: Some students have concerns about whether this type of events would create competition among young business owners and whether market competition would threaten their own businesses, especially when they work in the same industry. … Competition among businesses give people focus and drive. It encourages business owners to be more creative with their products and marketing plan. It is natural cause that businesses die when they can’t beat their competition. But we also have to be able to distinguish between positive and negative competition. Price competition would be one negative example. When businesses fight one another over who offers the lower price, it becomes destructive to the market. T&G: What’s new about this year’s entrepreneurship week? McWhorter: Another big focus during the week is social entrepreneurship. Social entrepreneurship is all about giving back to the community, and it is something that the government really encourages business owners to go for. For example, Patagonia, Inc. is a clothing company that believes in environmentalism. One percent of their profit goes directly into environmental research and ecological improvement. People who believe in their principles become their costumers. These type of businesses create a win-win situation where both their costumers and our ecosystem can benefit from it. It also helps to ease the general stereotype about how large corporations are usually greedy and selfish. For more information about Global Entrepreneurship Week Penn State, visit gew.psu.edu. No. 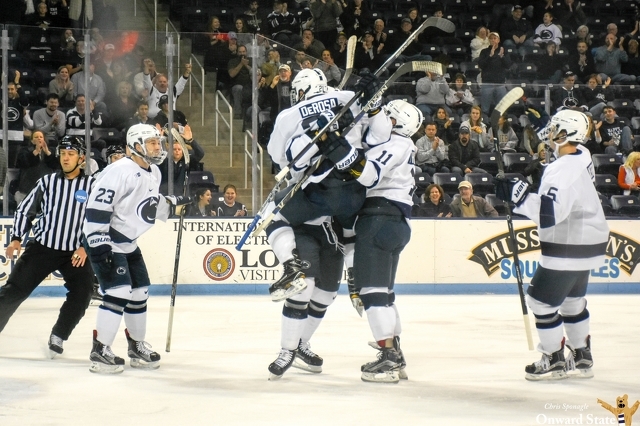 12 Penn State men's hockey extended its unbeaten streak to eight games Friday night in Pegula Ice Arena with a 6-3 win over Alaska-Anchorage. This matchup included David Goodwin’s 100th point, a top-shelf beauty from Vince Pedrie, and penalty woes.